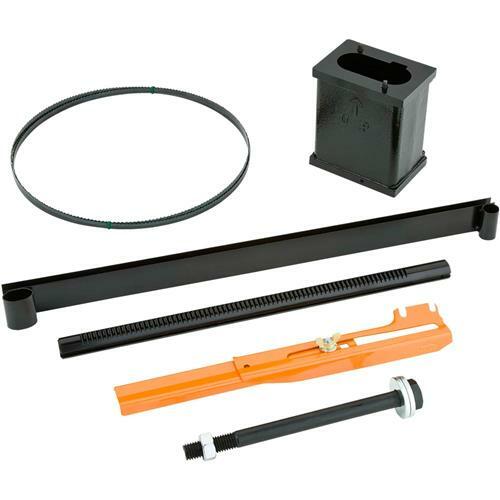 Increase your G0555LANV 14" Bandsaw's cutting capacity to 12" high with this bolt-on 6" extension block kit. Includes all necessary hardware plus extended blade guard and 3/8" x 105" x 6 TPI blade. Bought this for my son for Christmas and helped him install it on his new Grizzly bandsaw. Installation was easy, especially with two people. Great upgrade to the saw. The installation went well, and I am very happy with the increased cutting capability. Thank you Grizzly for putting the riser on sale. Great upgrade to my bandsaw, love the new resaw capacity. Easy enough to install, although, an extra set of hands would have made it easier. Took less than an hour, start to finish. The riser block kit was on backorder. I ordered it on 12-10-2017 and received it around 3-10-2018. The kit was worth waiting for and will add a lot of versitility to my band saw. Easy enough to install. Did it by myself with a little yankee ingenuity. Really would recommend having help though. Works great, always wanted to be able to resaw thick wood for crafts and other things. Ended up with some crazy grain wood for knife handles or gun grips. Saw really didn't need much adjustment after installing the kit. I am loving this thing! I have big plans for the extra capacity. It was very easy to install and i have no doubts or concerns about it being anything but rick solid and sturdy! The riser kit is excellent quality and easy to install. I just don't understand why it was back-ordered for so long. I would think that a kit for what is advertised as a best selling item would be kept on the shelf and ready to go when ordered. Having to wait 6 months for a back-ordered item is not what I expect from Grizzly because all my other experience with them has been positive. I am very happy with my purchase, everything fit very well, it looks good and I would recommend it to others. Excellent product giving extra height needed for larger cuts. I just wish they would sell the band saw in this configuration. Ii could have saved me some costs on the original blade and guards that now serve no purpose. Riser fit like a charm. No problems with tracking or vibration. Excellent upgrade that makes a good band saw even more versatile. Easy to install, I ordered the the g0555lanv and was thinking about the riser block so few days later I ordered riser kit, I hadnt even setup bandsaw when it came in because I wanted to wait for riser kit. It was pretty easy as I did it as I was setting up my bandsaw.Just make sure u have the correct tools for the bolt, can be done with cresent wrenches but best with a wrench. Cant beat 6 extra inches for another 90.00. Bought riser block with g0555lanv and installed with original assembly. everything went smoothly and unit was very well aligned with riser installed. only issue was a little rattle on the blade guard at certain elevations. A little bending has alleviated most. Was very simple to install, with the help of my daughter we had it lined up and bolted together in less than 10 minutes. I now have the ability to start cutting my own soundboards. Bought this with my Grizzly 14" band saw. It is a must have for sawing anything bigger than 6". Glad I did it immediately and didn't wait. Gives the saw a 12" cutting capacity. I bought this Riser Block Kit when I purchased the saw and installed it during the initial installation of the saw. Easy, straightforward, and simple installation. The installation of this riser block was so simple. I made some 'before' measurements of the wheels planes, installed the block, remeasured with perfect results the first time. I wish I bought this kit when I bought the bandsaw instead of waiting. Now I have old blades and will probably never remove the riser block to get the full use of the shorter blades. This is a real nice accessory. A bit tricky to install but well worth the effort. Get a second set of hands and some adjustable wrenches. Nice addition to the bandsaw.. Easy install, now I can re saw up to 12"
Easy to install ( with 2 people) and rock solid . I don't know why I waited so long to add it on. It gives the perfect amount of resaw capacity that i was looking for . All and all, the riser worked as expected. Did not have to shim it and it fit well. If you watched the standard Grizzly setup video online, beware that it sets up a little differently. Had issues with putting the new roller riser assembly bar into place. Way too tight going down. Once in place, all seems well. Don't put the thing together in a hurry. read the how-to instructions. Purchased this when we bought the Grizzly 14" bandsaw and we immediately put in on. Gives that extra height cut we need for the projects we do on our wood lathe. Great product! Definitely a must for resawing. Easy to install. A bit pricey especially with shipping. Easy to install. Well made. Shipped quickly. Happy with purchase. This went on the machine really well and easy.My 6 inch bandsaw can now rip 12 inch tall boards! !